This Palm OS program provides physicians and other health care providers talking points for discussing heart attack warning signs and survival steps with patients. It outlines the T.I.M.E. method for helping patients understand and feel comfortable with the advice being given. The program also includes suggested responses to common patient concerns, including questions about heart attack treatments, embarrassment about calling 9-1-1 for a false alarm, and worry about upsetting family members. Please note: Applications may be incompatible with the Tungsten T5. Download the file "ActInTime.prc" to your computer. After ActInTime.prc is saved on your computer, use the Palm desktop software to HotSync the file to your Palm OS device. Then, tap the Act in Time icon on your Palm OS device and follow the instructions to use the program. ©2003-2013 HeartBright Foundation. All rights reserved. 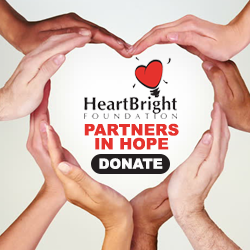 HeartBright Foundation is a recognized 501(c)3 charity. All donations are tax deductible.